Access to electricity is widely recognized as a crucial element in economic development, and in supporting community resilience and climate change adaptation. Health and education are negatively impacted when electricity is not available, when medicines and vaccines cannot be refrigerated, and there is no lighting for evening studies. Access to clean water and food security is improved when there is electricity for pumps and irrigation. Additional income-generating activities become feasible when power is available for milling, cold storage, small-scale manufacturing, services, and information and communications technology. Currently, nearly 1.2 billion people, predominantly rural dwellers, do not have access to electricity. Only 28 per cent of the people in rural Africa and 71 per cent in urban areas have access to electricity. The situation is worst in sub-Saharan Africa where the rural electrification rate remains below 10 per cent in 22 countries (IEA, 2016). Sustainable Development Goal 7 tries to remedy this situation by targeting universal access to affordable, reliable, and modern energy services by 2030. An estimated additional USD 32 billion would be needed annually to achieve this. Mini-grids are seeing a surge in interest as a less expensive and faster rural electrification approach compared to the extension of national grids. A mini-grid is a stand-alone set of small-scale electricity generators and possibly energy storage systems that supplies electricity to a small, localized group of customers and operates independently from the national transmission grid. They are thus suitable for remote areas with very low potential demand and scattered loads, and can also utilise renewable energy technologies to reduce operational costs and contribute to significantly reduced CO2 emissions. This nexus brief* focuses on rural electrification through mini-grids and their importance for the nexus of sustainable development, poverty alleviation, and climate change. Mini-grids will play an important role in achieving universal access to electricity but new business models, regulatory frameworks, and service networks are needed to address various technical, economic, and social challenges. *Download the full text from the right-hand column. This brief is also available in Spanish and French (see Further Resources below). Key messages from the brief are provided below. See the full text for much more detail, references and an example study form Pakistan. For mini-grids to develop their full potential for development, a range of economic, technical, and social challenges must be addressed. Key challenges and opportunities for meeting them are described in brief below; these are presented in detail in the full text. Increased private sector involvement is needed to achieve development goals. Huge investment is needed to achieve the universal access target. However, private investment in mini-grids remains rare, as it is still difficult to generate adequate margins with mini-grids. Private developers and operators will only consider entering the mini-grid business in countries where this activity can be profitable, or at least cost covering in the case of social businesses, NGOs and cooperatives (RECP, 2014). As the costs of generation and distribution of electricity in mini-grids are higher than on the national grid, mini-grid systems must be able to achieve higher revenues compared to a conventional grid system. Ministries and authorities must disclose to potential investors those villages and towns listed for mini- grid electrification that will not be connected to the main grid within a guaranteed period of time, and must implement a clear, reliable long-term scheme for when the national grid does arrive. Mini-grids need to be extendable to address growth in demand. The peak load demand in a mini-grid is often underestimated and the pace of load development difficult to predict. This can result in load management measures such as load shedding during peak hours, which are not easily accepted by consumers, and the refusal of new connection requests because of the lack capacity to serve peak demand. The design of mini-grids thus needs to address the possibilities for extending the capacity of power plants. The emergence of affordable batteries will offer new solutions to this problem. The integration of batteries into the mini-grid design allows for the downsizing of the capacity of the power generators to a level that is sufficient to recharge the batteries. The batteries can then be used to provide additional power during periods of peak load. 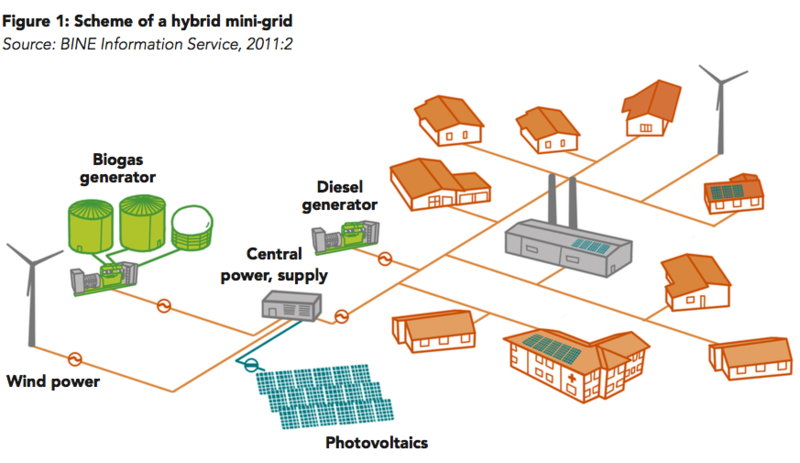 Technical innovations enlarge the potential of mini-grids. Developing countries can benefit from rapid technological developments in OECD countries by seizing opportunities to leapfrog certain stages of technological development. Developing countries skipped the stage of fixed line telephone networks, for example, and went directly to modern microwave based transmission networks. Similarly, in the energy sector, countries will be able to skip the phase of centralized power grids and jump directly to a decentralized or distributed power grid architecture. Complementary innovations that are in the pipeline will allow mini-grids to become greener and more stable, and to increase modularity and ease of use (IRENA, 2016). In particular, storage technologies are expected to play a growing role in improving the flexibility of power systems and in the market penetration of electric vehicles, heating and cooling systems, and mini-grid installations. Integrating these technologies in mini-grids can make the grids more cost efficient and beneficial for the local communities, thus enlarging their potential and importance for developing regions. Development cooperation will play an important role in this context. To reduce the burden on national development budgets, new business models need to be developed to attract private investment in mini-grids; national authorities need to be supported to prepare the legal frameworks for the construction and operation of mini-grids; village communities and entrepreneurs need to be supported to better utilize the available power from mini-grids; and service networks for maintaining and repairing mini-grids need to be established to guarantee a sustainable and reliable electricity supply. Meier, T. (2017) Mini-grids. Climate Change & Environment Nexus Brief. Swiss Agency for Development and Cooperation: Bern, Switzerland.